If you can afford it, you're unlikely to regret it. 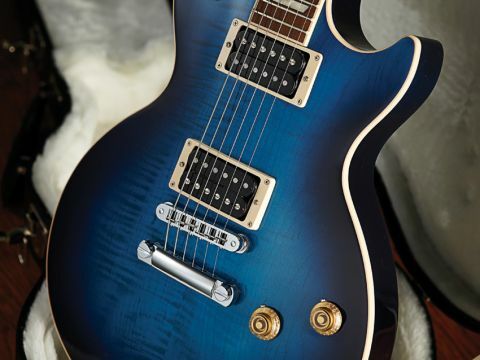 Everything about the Les Paul legend is here, bar the scratchplate; choice of neck profiles. You pay handsomely for that privilege. The Les Paul body is brutally effective: a back-breaking mahogany and maple slab that plays a vital role in the model's warm sustain. They might not be as ferocious as EMGs, but between the full-cream 496R and the white-hot 500T, this is the Les Paul sound you hear in your head. There are degrees of excitement. 'Level 1' is being given socks for Christmas. '10' is being asked to join Metallica. Right now, as we pop the case, inhale the bouquet of top-dollar guitar and catch the reflection of our slack-jawed faces in the buffed maple top of this beauty, we're hovering at a '9' (we knocked off a point because it's blue). "Everyone bangs on about the LP's overdriven tone, but what will really surprise first-timers is the full-fat, bell-like tone of the neck humbucker." Respect to Epiphone and the singlecut copycats, but this is the real deal: a gen-u-ine US Gibson Les Paul. No wonder we're cradling it like a baby and hissing like an alleycat when anyone approaches for "a go". It's tough writing an objective review of (arguably) history's most iconic electric guitar without it turning into a love-letter. As professionals, we'll try to focus, wipe away the formidable weight of context, judge this Classic Plus model against the modern market, and consider that it costs one-and-a-half grand. At that price, anything less than perfection would be a disaster. The Classic Plus is a little cheaper than the Standard (£1,899), but has everything on your wishlist (bar the pickguard). Graded maple and mahogany abound, and though purists can be sceptical about weight-relieved LPs, this one feels as sleek, solid and heavy as a racehorse. The binding looks a little bit plasticky, and your finish options are limited, but structurally, the lacquer application and tidy joints and cavities represent US workmanship at its gleaming best. It's cool of Gibson to offer two neck profiles, but whether you choose the rounded 50s neck or the slimmer 60s one, the Classic Plus is better at soul than shred. This is no Jackson Soloist; what you really want to do is sit back on the notes, milk the vibrato and luxuriate in sustain that - at the risk of sounding like Nigel Tufnel - hangs around for ice-ages. The use of heat-treated maple for the fretboard admittedly sounds weird, but whatever the forum-ites reckon, it feels smooth and solid to these fingers. Everyone bangs on about the LP's overdriven tone - and we'll get there - but what will really surprise first-timers is the full-fat, bell-like tone of that 496R neck humbucker. It's creamy without being flabby, and so full of character that even basic single-note riffs, sans reverb, sound so warm and woody that it's like having your ears buttered. It's a different animal when you flip the gain. Whereas on many inferior guitars you find yourself sat on the bridge, here we found neck and middle settings retain an edge and attitude that make them a killer choice for power-blues, with the 500T the perfect weapon for the really blazing lead stuff. They're not as vicious as EMGs, but the soul is staggering. The only problem here is what economists call the law of diminishing returns. Quite obviously, the Classic Plus is a killer guitar… but is it actually three times better than the Epiphone version? To be honest, no. But sober analysis and cold number-crunching have no place when it comes to the Gibson Les Paul. See, £1,600 doesn't just buy you a great guitar. It buys you the sensation of knowing that you have reached gear nirvana, you own a slice of the legend, and you will never look at another guitar again. Can you really put a price on that?